Despite being a rookie, rising Chinese actress Shen Yue (沈月) is already a star, thanks to her starring appearances in the uber popular television dramas A Love So Beautiful <致我们单纯的小美好> and Meteor Garden <流星花园>. But with popularity also comes more gossip, and Shen Yue finds herself topping social media searches again, but this time, it isn’t for a drama. 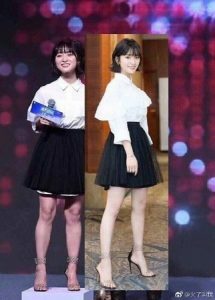 A netizen recently revealed untouched photos of Shen Yue, which showed the 21-year-old actress having much thicker legs and darker skin. 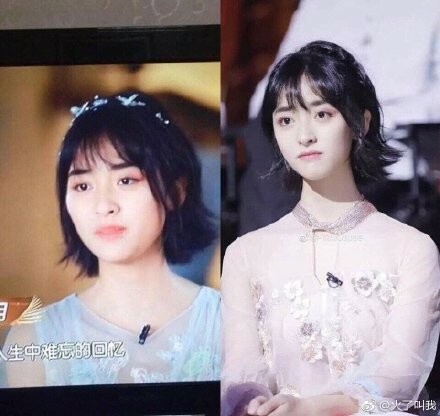 Known for her angelic looks, the non-photoshopped images came to a shock for many netizens, with one netizen saying that Shen Yue has “gone back to her original shape.” Another netizen joked that Shen Yue should start a photoshopping class if her acting career fails. Nonetheless, many fans and netizens came to Shen Yue’s defense, saying that it is unlikely that Shen Yue touched the photos herself, as her agency is in charge with all the content that goes into social media. Many of her own fan sites also edit her photos. Various fans shared untouched full-body untouched photos of Shen Yue, saying that bad angles and lighting could contribute to her “darker” and “thicker” legs. Shen Yue has opened up about her diet prior to taking on the role as Shancai for the 2018 Meteor Garden remake. Along with a busy schedule, Shen Yue has dropped a lot of weight in the past year. For Meteor Garden, Shen Yue had to give up her love for food. Her diet consists of no carbs, less fried and oily foods, drink plenty of water, and many “foam roller” exercises. Shen Yue is currently filming the TV adaptation of Soul Mate <七月与安生> alongside Chen Duling (陈都灵). They really should stop photoshopping celebs bodies if the result is completely different. @megamiaow The pic Wu Yi posted on his Weibo was taken from an unflattering angle and light. 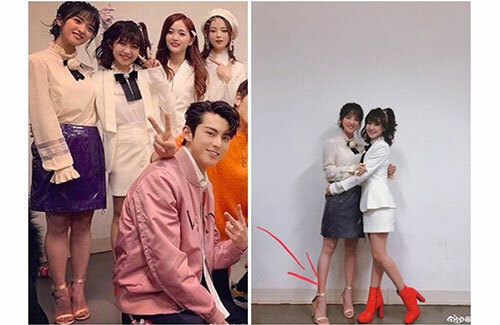 Furthermore, Shen Yue’s been standing hours with those heels. You know what happens when you stand with heels for that long? The musculus triceps surae get tensed and they ’swell’ like that. Also her toes look like they’re dying and looking at the backstage videos, she’s struggling to walk with those shoes a little. If you watch her videos, her legs look perfectly normal, not fat or dark. I checked some of her pics and most of them are not photoshopped to hell, unlike the fansite pics. Most fansites of any celeb love to make their bias too white and too slim so they look like plastic dolls.